What a difference a mile makes… (Kathmandu) | Blog the world!!! BEEP BEEP. We move to the left. BEEP BEEP. Now we step to the right. BEEP BEEP. This time we put our hands on our hips. But we’re not doing the timewarp, we’re just cross with all the traffic. As we walk through the old town in Kathmandu, the capital of Nepal, we seem to be in the way of every single car, motorbike, rickshaw and taxi. And it really was driving us in-say yay yay-ane. I’m quite proud of what I did there. If only I knew the words to all the verses maybe I could write about all our time in Kathmandu like that. But I don’t. The beeping is almost understandable when you consider the sheer amount of traffic here. When we arrived our taxi driver told us that Kathmandu has a population of 2.5 million. When we asked how big Kathmandu is he laughed (although I thought it was a pretty good question) and just said it was not big enough. It was only the next day when we headed out for a walk towards Durbar Square that we realised just how right he was. We could barely walk for the crowds, and stopping to read the map was near impossible. Hence we got pretty lost. Interestingly, on the odd occasion the crowds died down, we could normally see a cow. I can only assume that if you want to avoid crowds altogether in Kathmandu, you’d do well to follow a cow. 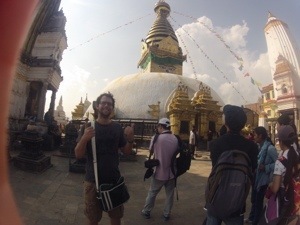 Although they were unlikely to lead us to Durbar Square, at the time, so was I. That night we went for a meal with Phillip and Lisa (a honeymooning German couple we’d met earlier, they too were buried in the map hunting for Durbar Square). They’d heard of a restaunt in the tourist area, Thamel, a similar but friendlier place to the Khao San Road in Bangkok. Thamel shares the Khao San’s touristy shops and continual hassle, but is much less seedy without a prostitute in sight. Northfield Cafe felt authentic, with daal baht (a Nepali meal served everywhere) and a Nepali band playing in the background. The next day we took a taxi up to the Tibetan temple Bodhnath, which I feel is best described as a big impressive looking Lego man (bigger than Duplo even!) And I am in no way bad mouthing the temple. I really like Lego. And Duplo. It was only here though, in amongst the monkeys which Gemma told me I shouldn’t play with, that Kathmandu made sense. The scenery was stunning, we could see Himalayan mountains in every direction, breathtaking landscapes with the city of Kathmandu in the valley. The city is so built up that when you’re in it you have no idea of the natural beauty that surrounds it… We’ve been in an overpopulated, dusty and stressful city when all the time we were less than a mile from this. Well this settles it, we’ll spend two more days here outside the city, and then we’ll move on. For tonight though, back into Kathmandu… Where madness takes control. Hey that’s a lyric from one of the verses! Get in.